An evening filled with laughter, great music and delicious food. 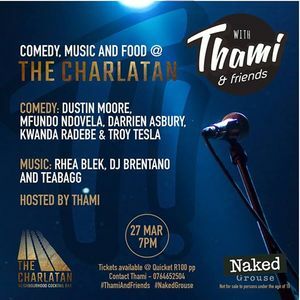 This months line-up includes comedians, Dustin Moore, homegrown talent in Mfundo Ndovela, Darrien Asbury, Kwanda Radebe and Troy Tesla. We have DJ Brentano and Teabag on the decks. We are also very fortunate to have songstress, Rhea Blek performing on the night.